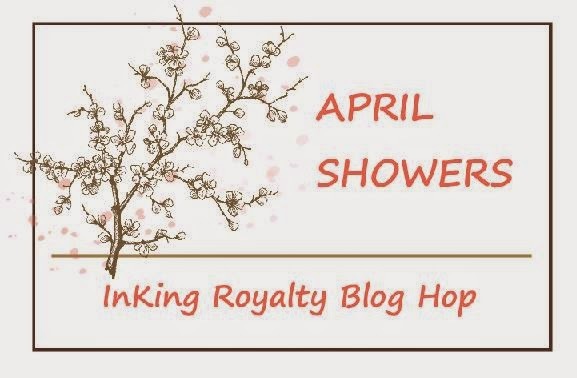 Welcome to InKing Royalty's April Blog Hop. Today we are celebrating April Showers - not only is this the season for Baby Showers and Wedding Showers, but May flowers are just around the corner, so you're certain to see a great variety of projects along the hop. You may have started the Blog Hop here or may have hopped over from Candy Ford at Stamp Candy. After you read my post, I hope you'll hop over to the next. If you get off track at any point during the blog hop, there's a complete list of participants at the end of this post. My project today is for a wedding Shower. This is a gift for the son of some of our friends and his bride. I knew I wanted to use the floral Festive Designer Kraft Paper roll to wrap the gift and the card would need to coordinate. I love this paper and have ordered many multiple rolls (and hope to order more before it sells out!!). It fits right in with the cottage decor of my mountain community and can be used for any occasion. 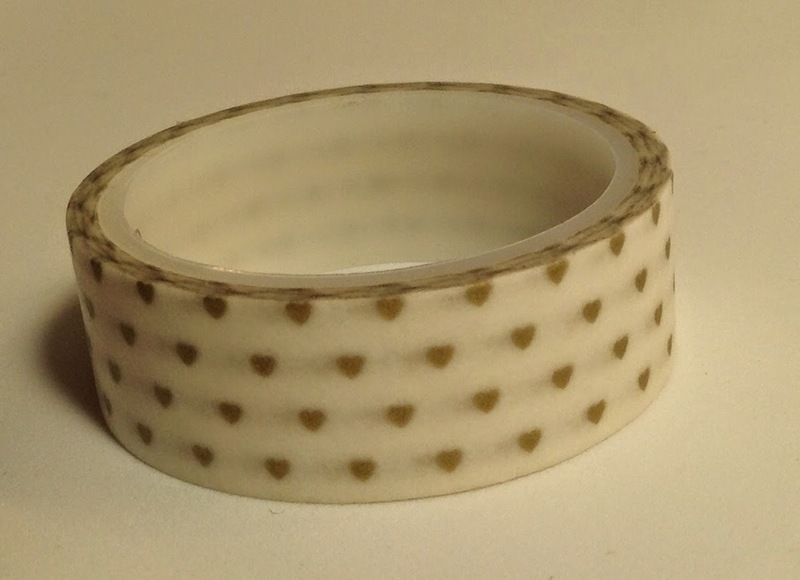 It comes in a set of two rolls - one with stripes and the other one that I used here. Here is my gift and the card to go with it. I wanted to make a 3"X3" card. 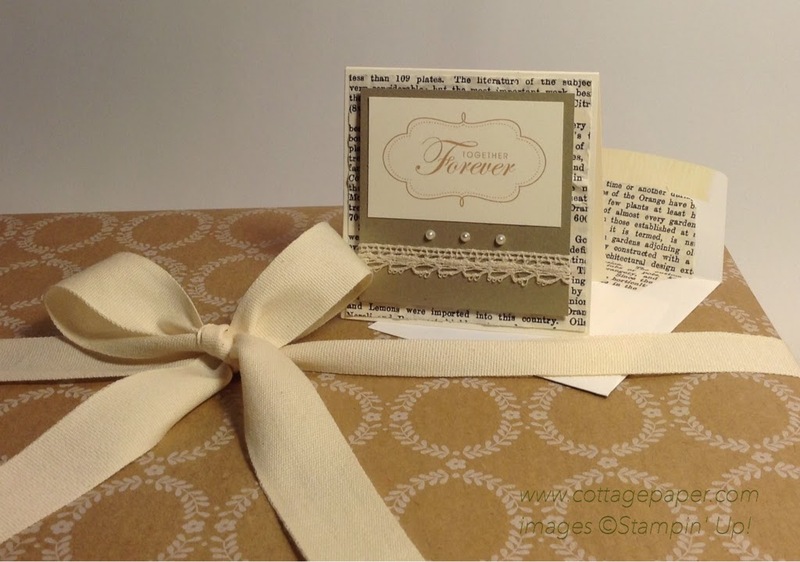 I started with Brushed Gold cardstock which I also LOVE and is great to use for layering. I thought Very Vanilla was the best base color to use with the wrapping paper. I then looked for a stamp but I have never bought very many wedding stamps and when I was not pleased with my choices I turned to My Digital Studio (MDS). MDS is a wonderful resource and sadly Stampin' Up! has announced that the software and downloads are being retired. The good news is that all MDS products are currently 30% off and if you do not have this software now is the time to acquire it! It can be used for so many projects, not just scrapbooking! When I looked at the MDS "stamps" I came across the Together Forever stamp which I thought was perfect. I paired it with a frame from the Frames with a Flourish digital set and printed it on Vanilla cardstock with Baked Brown Sugar digital ink. Another paper that I really love is Typeset and it goes great with Very Vanilla and Brushed Gold. I first scrunched the paper up in a ball and then flattened it to make a wrinkley layer. To finish it off I added some Venetian Crochet Trim and a few pearls to the Brushed Gold layer and popped it up with some dimensionals. I created a Typeset liner for the 3"X3" envelope using an Envelope Liners Framelit. Once I have written my message I will seal the envelope with some of the Stacked with Love washi tape that contains the little gold hearts. I love using washi tape to seal envelopes! It adds embellishment to the envelope and allows the envelope to be sealed and opened without damaging the envelope or liner. I ♥ comments and would love to hear what you think!! Thank you for stopping by today. I hope you'll hop along to the next stop on the blog hop, Lynn Kolcun at Avery's Owlery. You certainly won't want to miss any of these projects. NOTE: The prices listed below are the regular price of the item. Festive Paper Rolls, Natural Cotton Ribbon, Brushed Gold cardstock, and MDS software and digital downloads that I used to make this project now have reduced prices because they are on the Retiring List or the Clearance Rack. Check it all out!! If you decide to order and don't have a demonstrator I would appreciate your choosing me. Thank you!! Wow wow wow Katie. This is absolutely gorgeous! It's almost too pretty to open! You are so incredibly talented and your projects always inspire me. Thanks Pam! You're the best (but don't tell Brian I said that 😊)! I think we have similar styles because I always love your stuff too. So elegant, Katie! What a beautiful card! Anyone would love to receive this - even Pam (who deserves gifts from you since she is obviously your favorite - but I didn't hear that from anywhere). I'm so glad you could be a part of this fun hop!